Dinesh Chandimal thanked Virat Kohli and Indian fans for their support in Delhi. 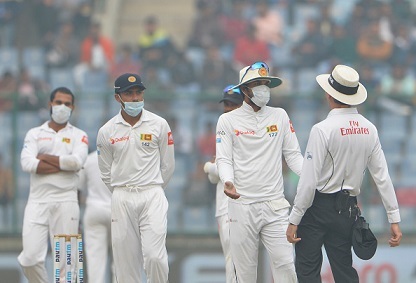 Dinesh Chandimal, Captain of the Sri Lankan side, on Wednesday, admitted that it was tough for his boys to play in Delhi's pollution as they were not used to it, and due to which they struggled in the first two days of the third and final Test again India. He also said that they decided to forget about the discomfort after a point and focus on the game after suffering in first two days in Delhi Test. Rajiv Shukla, a senior BCCI official said that the game could not have been canceled due to pollution, as the touring side fielded with N95 masks to combat pollution and protect the lungs from the poor air quality on day two at the Feroz Shah Kotla. The Indian skipper Virat Kohli has had to declare the innings at 536/7 after the Sri Lankans complained of breathing problems and fielding with masks, and even Suranga Lakmal had a rough time on the field, who started throwing up on the ground and was taken off the game was halted for 26 minutes on Day 2. With the latest effect, the questions have raised on Delhi’s viability as an international sporting venue.